For the first time a few days ago, a web user spotted a new feature in his mobile research results: the Red Slow Label. This indicator appears as a red box with “Slow” written in it and located right in front of the result’s URL. This discovery has aroused a keen interest among the SEO communities and the websites’ editors, I suggest you to learn more accross this article. Until now, the search engine hasn’t brought any official explanations about it. Nevertheless, one of their associates confirmed to Search Engine Land the existence of the testing (“We’re always experimenting”). We’ll notice the uncompromising nature of this warning: the red colour making it very visible, there are little doubts about the impact on the click rate upon a concerned result! This label raises lots of questions: what are the criteria Google takes into account to deliver the warning? For instance, Google could use a loading time measurement but this would bring up the issue of the user’s context (flow, location, etc.). Another approach would be to use a technical analysis in order to detect the cases leading to excessive slowness. Will all the websites be concerned? Is the project about penalizing the extremes or about imposing a new performance threshold to reach? Let’s remember in 2010 that Google stated in Webmaster Tools that a website loading in less than 1.5 seconds was considered to be fast. Historically, speed has always been the core of all concerns of the engine, and we see little by little web performance integrating more and more of their tools. Let’s also quote the functions of the Real User Monitoring present in Google Analytics, the “impact on loading time” gauge of the Google Fonts downloading page, or else the review of the destination page speed in the calculation of your Adwords campaigns’ costs! About the relation between web performance and SEO, the only well-known and measured direct impact was until now the correlation between the server response time on the volume of crawled pages by the Google Bot. In a simpler way: a time allowance is given to you, up to you to deliver the pages fast enough to the indexation robot in order to make the best out of it! Fast for the SEO, but not only! Web performance is an important matter to Google but it is far from being the only motivation to ensure the speed of your website. A fast website does help the natural referencing but enhances above all the user experience, and then its business performance. Indeed, through the growth of customer satisfaction, you significantly foster conversion and then raise your turnover. Here is an example to convince you: Shopzilla increased its conversion rate by about 10% by reducing its loading time by 5 seconds. Conversion rate, average cart, user satisfaction, hosting costs and many other subjects are impacted by the web performance of your website. Still in a testing stage, the Red Slow Label seems to completely root in Google’s philosophie. The approach may be compared to the recent apparition of the “Mobile Friendly” label, which besides will become a ranking criterion from April 2015. It is to us a strong sign that strengthens the probability to make the Red Slow Label coming true in the next few months! We have been preparing ourselves for more than a year to this possibility: www.dareboost.com will allow you to test your website and to optimize it. Don’t wait any longer and be ahead of your competitors! 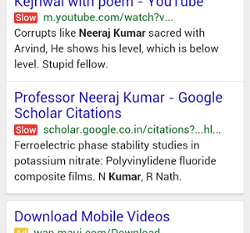 Slow is really sin on SERP and I have seen this label many a times now. SEEMS THAT GOOGLE DECIDED TO GO AHEAD WITH THIS KILLER red slow label. Do you have some news about this topic?